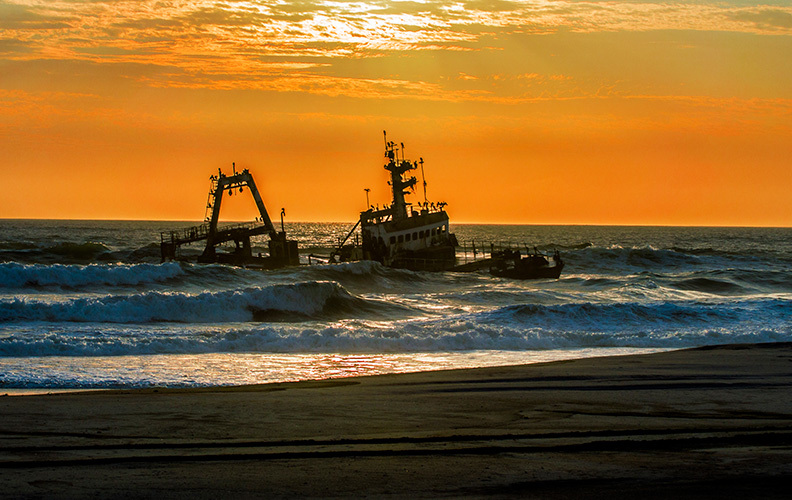 The Skeleton Coast is one of the most treacherous coastlines in the world due to strong crosscurrents, heavy swells and dense fogs caused by the ice-cold fast-flowing Benguela Current. Rocky reefs and sand dunes that stretch into the sea spell disaster for any vessel that get caught up in the gale-force winds and all-enveloping sea fogs, reducing visibility to virtually nil. Fire broke out on board of cable laying vessel Chamarel on August 8 2012, when vessel was 68 miles north of Hentiesbay, Namibia, busy with laying cable from Cape Town to Europe. Initial reports indicated that a fire broke out on the bridge and then spread quickly to the rest of the vessel. Patrol boat Nataneul Maxwilili rescued the crew and took them to Walwis Bay, reportedly no one was injured, no causalities. Crew consists of some 40 plus people. Abandoned vessel is drifting off Namibian coast. French cable layer vessel Chamarel grounded and was still burning unattended as of afternoon August 9. Locals reported two loud explosions heard, and around 14:30 LT vessel ran aground on a sand bar. France Telecom-Orange said the cause of fire still unknown. There were 56 crew on board, all safe. The vessel was returning from a mission to repair the Sat3/WASC/Safe submarine cable which connects Portugal and Spain to nine West African countries, and then to India and Malaysia. The Chamarel, formerly known as CS Vercors, is actually a historically important vessel in international fiber optic communications. The ship was in service since 1975, and laid over a hundred thousand kilometers of cable, including AT&T’s TAT-6 transatlantic cable, and EMOS-1 the first Israeli-built undersea cable. In 2000, the vessel was used to set the record for the deepest submarine cable at 1,610 meters (just over one mile). France Telecom-Orange currently operates six cable ships, four are dedicated to maintenance services in the Mediterranean basin, the Atlantic Ocean and the Indian Ocean, and two are used to lay new submarine cable. The vessel has finally stranded 30 km off Henties Bay across from The Fishermen’s Inn B&B. Still smouldering in a very angry ocean. 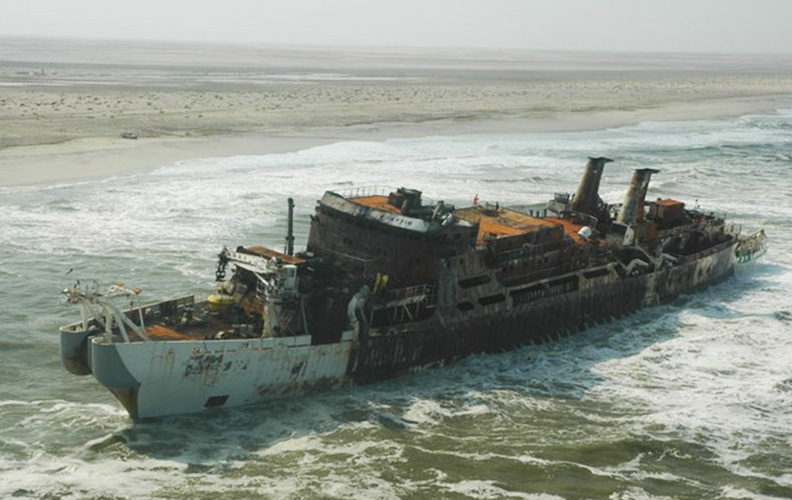 The Zeila got stranded on 25 August 2008 in the early morning hours near “Die Walle”, a popular fishing spot about 14km south of Henties Bay. The fishing trawler that was sold as scrap metal to an Indian company by Hangana Fishing of Walvis Bay got stranded after it came loose from its towing line while on its way to Bombay, India shortly after it left Walvis Bay. It seems that they will be able to rescue no more than a few usable items from the stranded ship. The East German trawler of 180 tons grounded in thick fog 2 miles south of the Ugab River Mouth. For many years she was a well-known landmark and cormorants used to nest on her battered frame. Eventually she could not withstand the beating of the sea and slowly disintegrated. Some parts of her structure were washed ashore. Parts of her engine block are still visible today. The Winston indicates a favourite angling spot for holidaymakers and can be seen at Durissa Bay, about 23 km north of Mile 108. There are many stories about sunken ships and failed rescue attempts such as the almost unbelievable series of events related to the Dunedin Star, a British passenger liner of 13 000 tons that stranded in 1942, 40 km south of the Kunene River mouth with 106 passengers and crew members on board. They managed to take 42 people to the shore while the rest were rescued from the ship. After many fruitless and grueling attempts to reach the castaways on the beach, in the process of which another boat, the Sir Charles Elliott, two of its crew members and a bomber airplane were lost, all of the castaways were eventually rescued. “In December 1976 the Suiderkus, a Cape Town-based trawler, which had cost R3,5 million to build and was equipped with state-of-the-art navigation equipment, ran onto the rocks at Möwe Bay on her maiden voyage. In a few months the expensive trawler became rusted and derelict, reduced to a picturesque but temporary landmark. Battered by the waves and the passage of time, her huge bulk gradually broke apart. One stormy night her hull was deposited high on the beach. Until she disintegrates completely, she will serve the rest of her time as a cormorant’s perch and a topical subject for photographers.” (From Skeleton Coast by Amy Schoeman.) Anglers at Terrace Bay can see this wreck while driving on the beach. Whilst moving inshore to fix their bearings the 90-foot trawler, under command of Capt. W.S. Gillion, ran aground 5 O’clock on Sunday morning. The incident occurred 165 miles north of Walvis Bay. The crew of ten was able to get ashore safely in a life raft. Police Landrovers under command of G. Brand and Port Captain Bob Harding brought them back to Walvis Bay on Sunday night. This wreck can be seen at the most southern border of Torra Bay. Nature Conservation erected a signboard north of the Ugab River, on the Torra Bay road. The Montrose stranded in 1973 and can be seen just south of the southern border of Torra Bay. This wreck has become a popular perch for cormorants. A small piece of the S.W. Seal can be seen just south of Toscanini. Nature Conservation erected a signboard north of the Ugab River, on the Torra Bay road. South of the Winston Wreck and old steel wreck is visible and marks a popular angling spot. Nothing is known of this wreck. From time to time anglers mention a large steel wreck being visible at low tide near Horing Bay. Its origin is unknown. Presumably it is a wreck from the pre-colonial period. David Krynauw tried to find references in this regard but without success. No clues could be traced At Lloyds of London either. The Norwegian Bark came on charter for the Damaraland Guano Company to deliver stores to Cape Cross and to load guano for the U.K. She had sprung a leak in rough weather on her outward voyage. Additional pumps were supplied at Cape Cross, but after two days it was found that she could not be kept afloat. It was thus decided to beach her. The crew was taken back to Europe by the Woermann Liner, Lothar Bohlen. Over the years many wooden parts of this ship were washed ashore in the bay north of Cape Cross. It is not known whether any parts of her are still recognisable today. This fishing trawler stranded at the North Dune of Henties Bay. For many months anglers used to sit and fish from her during high tide. In time, the rough sea smashed her to pieces. Many planks were carried away by visitors and parts of her structure was probably also used as firewood. The late Mr. Keet mentioned amongst others that the nameplate of this boat was kept as a decoration at one of the holiday houses at Henties Bay. It is not known whether the engine block is still visible during low tide. “Herero chief Hembapu returned along the coast towards the Omaruru River after a raid on some Nama further south. At the river mouth they came upon a shipwreck and two naked white men – white people they had never seen before. They gave them Omaire. The one man died shortly afterwards. They slaughtered an ox in order to leave some meat for the other survivor. The Hereros then commenced trekking further inland along the Omaruru River.” Unfortunately, no date of that particular incident is known. Just north of the Gertrud Woermann II the Natal Coast of over 3000 tons stranded in thick fog. She was on her way from Matadi to Cape Town. 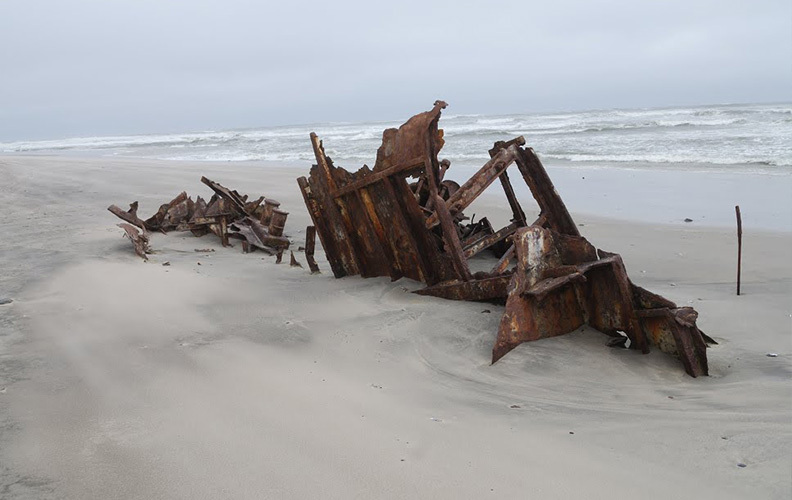 On weekends school children from Swakopmund used to play on this wreck. She had a large consignment of coconuts on board, which was a delicacy at the time. A scrap dealer eventually dismantled her. Today only part of her engine room and boilers are visible at low tide. On her second voyage from Germany to Swakopmund this ship grounded in thick fog on a reef thirty kilometres north of Swakopmund. She weighed 4603 tons and was built by Wigham Richardson at Newcastle. She had 400 soldiers, horses, war material, mail and general cargo on board. The gunboat Vineta, at that time on a visit at Swakopmund, assisted with the salvage operations. (The northern suburb of Swakopmund was named after her.) No lives were lost. The wreck of the Gertrud Woermann was visible until 1912, when she disappeared under the water during a heavy storm. Today only a beacon, the so-called Gertrud beacon, marks the spot where she has sunk. It is a popular fishing spot. Some old sail ship parts have also been found along the coast. In all probability it originated from old American whalers, which used to frequent our coast during the early 1800’s on their whaling expeditions. At certain periods up to 40 ships were reported to be in Walvis Bay. From Hahn’s map of 1876 it is known that whaler men landed at the Omaruru River mouth where they had temporary shelters. Large blubber pots were used on land, as the making of fire was easy with all the driftwood, which had been brought by the river from upcountry. One must also bear in mind that the Benguela current could have carried parts of shipwrecks further north where it eventually washed up on the beach. Various trawlers sank off Henties Bay. Most probably no remains of these wrecks are visible. Certain planks or parts of these structures might eventually wash ashore. In some of the Henties Bay houses one might find some wreck artefacts, which were found along the shore during fishing trips. Shipwrecks that occur further north than the Suiderkus can only be seen from the air. The northern section of the Skeleton Coast Park is a concession area and restricted to fly-in safaris.